There are times when my brain builds something up so much that the actual event elicits little more than a, “Ho, hum. That is not what I expected.” Such an event happened last night during the Style of the Month portion of the Menomonie Homebrewers meeting. 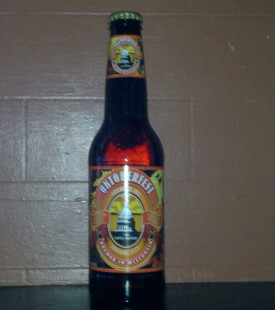 Oktoberfest is one of my favorite beer styles, partly because every example I have tried has been enjoyable. A great malty flavor backed up with a firm bitterness and a dry finish leaving you wanting more. Oktoberfest was the first beer I liked. Since our club is located in Wisconsin, we try to find a Wisconsin-based brewery when we purchase the style of the month for our meetings. I’d heard good things about Capital Brewery out of Madison, WI. I figured their Oktoberfest would live up to their reputation. Don’t get me wrong, the beer was good, it just wasn’t what I expect from Oktoberfest. The only thing close to what I expected was the color. The color was a little lighter than most Oktoberfests I’ve had, leaning toward orange rather than the “fiery amber” touted in Capital’s marketing speak. The aroma was filled with honey-like sweetness and hints of fresh-brewed iced tea. There were fruity esters and no hop aroma. The lack of hop aroma is appropriate for the style, the fruity esters . . . not so much. The flavor was sweet up front, with a strong crystal sweetness backed up with a really firm, cloying sweetness that didn’t seem to end until I took a drink of something else. The expected dry finish never materialized. I don’t know if Capital ferments this beer with an ale yeast rather than a lager yeast, which is possible if you control the fermentation or if they actually used a lager yeast but the temp got away from them. 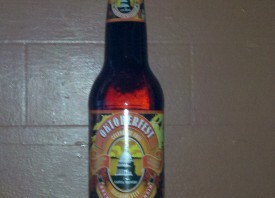 As a first exposure to Capital’s Oktoberfest, I was disappointed and I cannot recommend this beer as an Oktoberfest. It’s a good beer, it just wasn’t what I want from this style. If you’ve had this beer and it wasn’t what I described above, let me know in the comments. Did you have it from this year(2012) or a different year? If you’ve had it from multiple years, does it change every year? I’m excited to hear your thoughts!